A windy day along the Goa coastline facing the Arabian Sea. Picturesque Palolem Beach, enclosed by a thick forest of coconut palms in far south Goa, is arguably the state’s most beautiful beach. This mile long, shady, semi-circle shaped beach continues to grow in popularity every year, and it’s become very lively with the diverse crowd that it attracts. The unparalleled beauty of this beach has helped it earn a reputation of best picturesque beach of Goa. This is a small beach located in the holy town of north Karnataka. The best part is that Gokarna shares its neighbourhood with India’s best four secluded and pristine beaches. Gokarna attracts a huge number of pilgrims and ardent holiday makers. Looking for a beach with a lot of water sport activities especially scuba diving? Well, you need to visit Tarkarli beach in southern Maharashtra. It is considered as the best beach for scuba diving and snorkeling. The picturesque beach houses one of the best coral reefs across the country. One of the best things about this beach is that it is untouched by development until the present day. Although not on tourist trail, the beach has been immensely successful retaining a rustic village feel. You would love to get one of the best homestay accommodations here on the beach. Located on coastline’s northern stretch, the scenic beach of Arambol has earned a reputation of hippie haven in the recent years. Earlier a small fishing village, the place is presently thronged by tourists. Arambol is a hub for a huge number of alternative therapies including yoga, meditation, tai chi, and reiki. You would simply love the relaxing and rejuvenating nightlife of the beach replete with soul soothing live music and jam sessions. No wonder this beach is deemed as the best beach for hippies and ardent musicians. To reach the famous St. Mary’s Island, you must take a boat journey from Udupi. The small beach is beautifully enveloped in shimmery white sand and sparkling translucent water of the Arabian Sea. The beach is known to be one of the majestic and magnificent islands across Malpe. Tourists are fascinated by the bizarre basalt rocks formation here which have been converted into unique vertical blocks bordering the island. Book one of the carefully designed honeymoon tour packages online and you would simply love spending time here and collect the beautiful and rare shells lying along the coast. The bewitching beauty of St. Mary’s Island allures tourists from far off places in India and abroad. Located in northern Goa, poeple from all over the world visit the wide open panoramic beaches of Mandrem, Ashvem, and Morjim. These are conveniently situated adjacent next to each other. Reckoned as one of the hip and trendiest beaches, visitors simply love to indulge in some fun at the Groovy beach bars and clubs here. There are many shops selling trinkets and specialities of Goa and restaurants promising lip smacking items. Don’t forget to spend some time in the beautiful beach huts, and chic resorts there. Widely known for a good number of yoga retreats, this beautiful beach is a must visit for all. Sunset Ashram of this beach is best bar of Goa. Ashvem is the best trendiest beach of North Goa. If you are looking for a toned down and secluded version of commercialized Kovalam Beach, head straight to the dreamlike Varkala. The awe-inspiring beauty of this beach will leave you mesmerised. The beach setting is stunning and enchants visitors instantly. Long winding cliff stretch and kaleidoscopic views extending over the great Arabian Sea make this beach a must visit for all. Varkala is flanked by a paved footpath that runs along cliff length and circumscribed by tall swaying coconut palms, beach shacks, quaint shops, hotels, and beautifully built and maintained guest houses. The beach has the most spectacular setting. This is one beach all sea lovers must visit. The Time Magazine voted Radhanagar Beach as ‘Asia’s Best Beach’. Located on Havelock Island of Andaman and Nicobar Islands sprinkled across the great Bay of Bengal, the sea looks extremely beautiful and celebrated widely for its calm, still water and gleaming white sand. If a lot of action and thrill is your idea of spending time on the beach, head straight to the Baga Beach of north Goa. It is always busy and the most happening beaches on the coast. The fine dining restaurants nearby serve delectable variety of sea food. Some of the activities you can enjoy here include water sports, dolphin sightseeing trips, parasailing, beach shacks, and a visit to the finest clubs and bars. If you haven’t had the pleasure of witnessing a lighthouse, visit Kovalam. It is referred to as the most developed beaches of Kerala. Located close to the city of Trivandrum, this picturesque sea is made from two coves: Hawa (the Eve’s beach) and Lighthouse. This Lighthouse is also the biggest and busiest. The promenade of this beach is conveniently flanked by many open air restaurants. The lighthouse on the beach is known to provide stupendous views of sunset and the neighbouring areas. 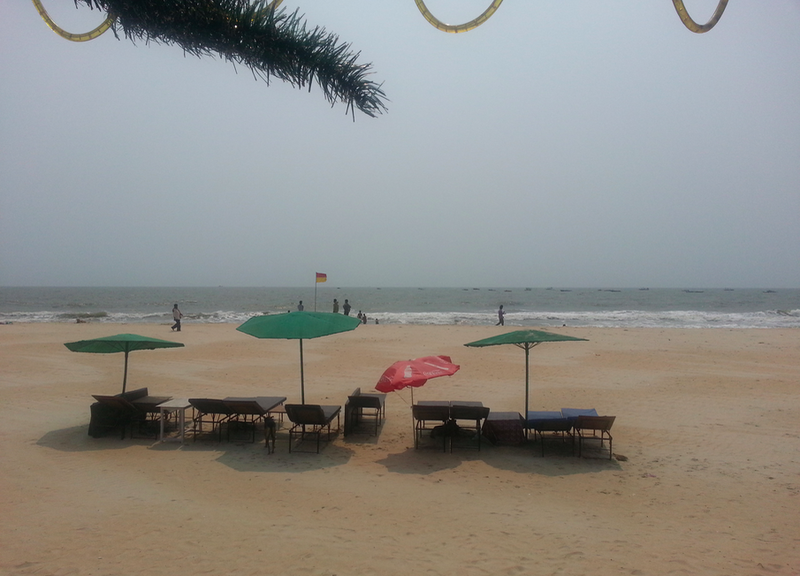 Located conveniently on South Goan island, the beach will definitely mesmerize you. Bordered with beautiful rocks, azure water, and thick trees, the beach will steal your heart. The name of this beach has been derived from its capacity to allure varied types of butterflies fluttering across the site. The picturesque beauty of this beach is similar to a beautiful wonderland. You may even get lucky to catch a glimpse of amazing dolphins playing around in the sea. Set only a few kilometers off Pondicherry’s East Coast, this tranquil secluded beach is one of the most popular amongst a beach lovers across India. Although only a very few facilities are available on this beach, this amazing site promises the best of relaxation and rejuvenation for visitors. All you need to do is explore this beach in absolute isolation to establish a deep connection with your inner self. Simply sit back and relax beautiful shady trees or take a relaxing stroll along the mesmerising cold sand stretches. The roads are narrow and very complex. Hence you may face some difficulty arriving at the beach. However, when you reach this place, you will be happier to have witnessed the bewitching beauty and experienced the tranquility of this beach. This beautiful beach is located on coastline of Orissa state’s. It is deemed as one of the most enchanting beaches of the country. The on-going stretch of mesmerising white sand and gleaming waves is a respite from maddening city crowd and stress. Once here, you can enjoy inner peace and solitude that relaxes and rejuvenates you. One of the major attractions of this beach is the beautiful backwaters. Visitors simply love taking a dip into the peaceful calm water or enjoying a romantic stroll with their partner. The enchanting views, amazing ambiance, and bewitching surroundings make Talasari Beach an ideal hideaway for all those looking forward to escape the annoying bustle of city life. Now that you have a list of best Indian beaches, don’t wait anymore. Head straight to one of these places and enjoy spending quality time with your partner. Happy Beach Honeymooning!